Glutathione is produced naturally in the liver. It is made up of three amino acids, and it is vital for cellular metabolism. It protects against oxidative stress caused by free radicals, is required for the immune system to function properly, and is a potent detoxifier. The importance of glutathione has been validated by over 92,000 scientific articles, more than twice the amount that has ever been published about vitamin C. In fact, nutrition experts believe that it is just as necessary for our health as oxygen, food and water. 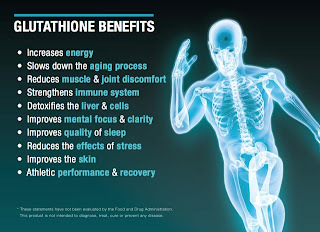 Glutathione helps other antioxidants and nutrients do their jobs properly. Without it, no amount of supplementation or healthy eating will do us any good. In addition, since our immune system depends on this substance, a lack of it causes us to get sick more often. It also protects our mitochondria, which provide energy to our cells. Our mitochondria are very vulnerable to the effects of free radicals, so if glutathione weren't present they would deteriorate very quickly and our cells would die. Furthermore, this antioxidant helps our body get rid of toxins. This is important, because most of us are exposed to dangerous chemicals on a daily basis. In fact, a study by Cornell University found that over 60% of the world's population is harmed by air pollution, and the Institute of Occupational Safety and Health recently found that almost 900 of the chemicals used in cosmetics and skincare products are toxic. Although glutathione is produced naturally in the body, its levels begin to decline at around twenty years of age. From that point, they decrease by 8% to 12% every decade. By the time a person is 50, these levels are only at 60% to 70% of what they were in their teens. The level of glutathione in our body is also lowered by sickness, toxins and other things that cause physical or emotional stress. Because it is nearly impossible to avoid these things with our modern lifestyle, most people do not have enough glutathione in their bodies.